That doesn’t sound quite right, does it? It doesn’t sound right because it isn’t the Second Amendment of the U.S. Constitution; it’s the Second Amendment of the Brady Campaign, of Charles Schumer, Frank Lautenberg, Diane Feinstein, the Million Mom March and the Violence Policy Center. In other words, it’s the Second Amendment of gun control extremists. These are the terms in which they want to frame the discussion of our civil rights. Their current jihad targets the mythological beast often referred to as the “assault weapon.” Now, we’re not quite sure what defines this monster, but we do know that unless the fraudulent “Assault Weapons Ban” of 1994 is extended, these deadly tools of mass destruction will suddenly flood our streets, and turn our schools and ghettos into killing fields. This is all, from stem to stern, a complete fiction – the terms, the description of the law, and the imagined consequences of non-renewal. Not a word is true. The “Assault Weapons Ban” of 1994, a.k.a. the “Violent Crime Control and Law Enforcement Act of 1994,” is one of the great scams of the Clinton era. It is a masterpiece of double-speak and equivocation. In reality, the law banned rifles that had detachable magazines and two or more of the following characteristics: folding or telescoping stock, pistol grips, bayonet mount, flash suppressor, or threads to attach a suppressor, or a grenade launcher. Further, it banned the importation of foreign-built rifles having some or all of these characteristics, and it banned the ownership by civilians of high capacity magazines (more than 10 rounds) produced after 1994. (Notice that a rifle with a 100-round drum magazine and a grenade launcher could be completely legal under the AWB as long as it did not have a bayonet lug, flash suppressor, folding stock or pistol grip). Notice also that AK-47’s, M-16’s, Uzi’s and MP5’s (real assault rifles and submachine guns) are not addressed by the Assault Weapons Ban of 1994. Guns capable of automatic fire have been controlled by the National Firearms Act of 1934 for the past seventy years. Contrary to the overheated rhetoric of the gun grabbers, the AWB will have no impact whatsoever on the presence of AK-47’s and Uzi’s on our streets. It never has. The gun control jihadists lie because they know their agenda will fail in the light of truth. Were the gun grabbers serious about fighting crime or violence, they would be focusing on weapons that figure prominently in the violent crime statistics of America. Military-style rifles do not. The real agenda is to ban military-style rifles because they are seen as being vulnerable to these emotional, non-rational appeals. Next will be semi-auto handguns, then revolvers, and so on, until we’re down to single-shot duck guns. The agenda is to disarm and force the cult of victimization on the free and self-reliant citizens of America. The Second Amendment is not about duck hunting. It never has been. It’s about freedom. It’s not about Charles Schumer, Dianne Feinstein, Donna Dees-Thomases or Josh Sugarmann telling me what kind of rifle I need or should have, and for what purposes. It is about responsible citizens of this republic making conscientious decisions for themselves about the tools necessary for their own security, safety, and recreation. If we are to counter this campaign of disinformation, our response needs to be more than technical lectures about the fine points of firearms nomenclature. We must define the terms, but more importantly, we must shape the discussion in terms of civil rights, individual liberty, and the inalienable right to self-defense, and that includes the bearing of arms which are on a par or superior to those which might be used against us. The “Assault Weapons Ban” does not go gently into that dark sunset. Its swan song is accompanied by a wild chorus of phony claims, political recriminations, unearned chest-thumping from some gun rights organizations, and dire prophesies from gun grabbers and opportunistic politicians. One statistic that has intrigued me through this latest round of the debate is that a significant percentage of NRA members are supposed to support renewal of the AWB according to polling by the Brady Campaign and the Violence Policy Center. While I don’t pretend to know what these folks are thinking – and no doubt a significant sub-percentage of this group may be attributed to the way the questions are asked and misunderstanding about what the AWB actually does – I can’t help but wonder if the NRA supporters of the AWB support its renewal precisely because they do understand it. They have done their homework and know what a toothless and hollow piece of cosmetic legislation it really is. Perhaps they prefer this feel-good hodge-podge of cosmetic restrictions to another more restrictive ban which could appear in the future. “Lessee, how does it go? I can have a 30-round mag but no grenade launcher; or I can have the grenade launcher as long as I don’t have the bayonet lug. No, I can’t give up my bayonet – I may need it to hold off the next banzai charge by the IJN marines lurking just the other side of the Stop-N-Shop.” It’s just silly unless you understand that it’s about symbols and images. The AWB is about conditioning people to accept incremental prohibitions on guns based on features, and we know where that goes. It is about demonizing civilian ownership of military style rifles (“…no one goes deer hunting with an AK-47”). It is about characterizing anyone who wants to own a military rifle or even a high capacity semi-auto pistol as a “domestic terrorist” or a potential mass murderer. Remember the historical setting that produced the AWB. Following Ruby Ridge and Waco, membership in civilian militia groups was expanding rapidly and the Clinton administration feared these groups in a way that was completely disproportionate to the actual threat they may have represented. 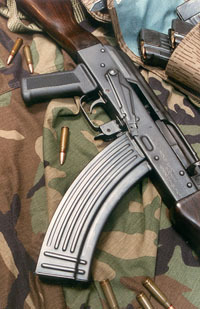 Military rifles are only rarely used by street criminals and drug gangs. They were the preferred guns of the civilian militias. Symbol, image and politics – the stuff the AWB is made of. Another statistic that has been bantered around is that crimes with “assault weapons” have decreased since the ban because “we have gotten these weapons of mass destruction off the streets.” Makes for a great sound-bite, but it suffers from a fatal flaw in logic. Nothing has been removed from “the streets” as a result of the AWB. Has anyone had any difficulty in buying a semi-auto military rifle or procuring high capacity magazines for their M9’s during this ten years? No. If you could buy a five-shot snubnose revolver, you could buy a semi-auto Kalashnikov clone. And for that matter, if you were willing to pay the inflated prices and go through the red tape, you could buy an honest-to-gawd selective fire assault rifle or submachine gun. If crime with “assault weapons” has decreased, it is because of other forces, such as demographic changes and the fact that all gun crime has diminished since its statistical peak in the late 80’s and early 90’s. The AWB had nothing to do with it. The AWB has always been about symbols and politics. It still is. I will make two predictions: nothing will change in terms of crime statistics as a result of the AWB sunset, and it will be back. When it comes back, it will be far more obnoxious, restrictive and unconstitutional than the old, dead AWB it hopes to replace. Gun-prohibition lobbyists are after much more than AK-47s. GOA Fact Sheet on the AWB – If you don’t read anything else, read this one. The ‘Assault Weapons’ Ban Is Dead – by John R. Lott, Jr.